Ask anyone within a stone’s throw of the River Esk (once its two halves have joined and found their way out of Dalkeith Country Park) and they will be in no doubt about what is meant by “The Burgh”. Most Scots towns have a fair conceit of themselves. But you have to be at the Honest Toon Association’s dinner when the members of that august organisation stand on their chairs and launch into the Town Song (“Musselburgh was a burgh when Edinburgh was nane“). It’s only a shade less bristling than “whau daur meddle wi’ me?” but you get the drift. But despite such healthy spirit and loyalty to the community, Musselburgh—like many medium towns whose centres are being eroded by changes in retail dynamics—is in need of some attention and revival. The largest town in East Lothian by a factor of two, its catchment includes the two large villages of Wallyford and Whitecraig, neither of which have significant retail and also most of Prestonpans and Tranent, neither of which enjoy full-blown High Streets on the scale of Musselburgh but have frequent bus links there. The resulting catchment of around a third of East Lothian’s population served it well and ensured healthy retail sales—despite traffic jams—until the turn of the millennium. By then, the recently completed A1/A720 started to draw people to Kinnaird Park and Straiton. This accelerated over the next decade as many households with cars moved into the area and other nearby malls like The Fort drew more people away. When Somerfield’s and other ‘anchor’ shops closed, the retail offering’s draw weakened further. To keep Musselburgh town centre busy and vibrant whilst taking actions that promote additional business in Musselburgh town centre. To encourage improvements to support existing businesses and town centre users and encourage investment into the town centre. To enhance the setting of the local town centre, which is the unique selling point of the town. To build on the unique identity of Musselburgh by explaining more of the history and heritage. The challenge was “to make the town centre more appealing to users”. All of the above seems worthy and considered. But, digging deeper into the 24-point Action Plan leaves the reader with no clarity as to what strategy (i.e. the overarching plan, as opposed to operational/tactical detail) actually exists. This is compounded by the absence of any recognition—let alone action to address—a number of key factors identified in the document. This forms an unfortunate example of “Ready—Fire—Aim” which typifies a plan of action that has misplaced its strategic direction. 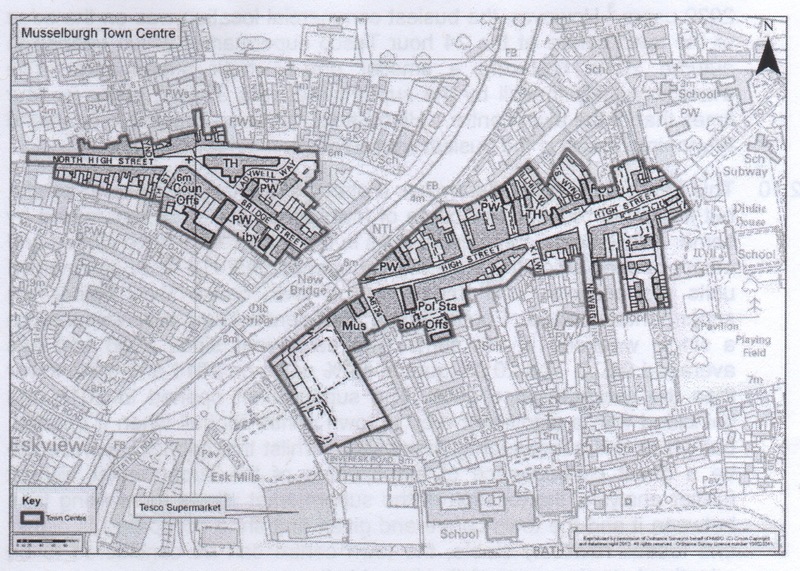 First of all, the map above illustrates the most glaring omission (despite being clearly stated in the third objective above) of the USP of the town centre is the Esk and its setting. Not only is this a most attractive aspect, perfectly sited to link the two components shown on the map, but the opportunity to do so is even more apparent than in the few Scottish towns that enjoy such an opportunity (principally Inverness, Ayr, Dumfries and Perth). The idea that the wide, green banks of this linear park could be woven in to the retail offerings with riverside cafes, restaurants, kiosks and recreational facilities is nowhere mentioned. Secondly, the most unfavourable factor of heavy traffic all along the High Street and repetitive breaching of SEPA air pollution guidelines is nowhere addressed. Quite apart from the non-green waste of fuel that stagnant traffic symbolises, the constant noise and sight of traffic is unpleasant, quite apart from difficulties created in crossing the road. At present every single vehicle crossing between East and West must pass the single choke point outside the Caprice restaurant (25,000 vehicles each day). At no point has the possibility of re-opening Inveresk Road for access to/from Tesco/Eskmills or of the ‘Electricity’ bridge to link North High Street with Millhill—or any other traffic solution been mentioned, let alone considered. Thirdly, the attraction of increased footfall is already embedded in the numbers provided but no conclusion drawn. The current footfall per week is barely 9,000, and that, spread over 178 commercial units is barely 10 customers each day. On the other hand, Tesco—not 300m from most of the area designated—enjoys over 37,000 per week. It seems obvious that attracting Tesco customers to spend time elsewhere would, if only 50% successful, result in a tripling of footfall and a revolution in business viability. The manner in which this could be done requires study but redevelopment of the underused council car park near Tesco beside the Roman Bridge into riverside business and the extension of this to the western end of the High Street that already backs on to the river would provide an attractive link to lead people to do just that. While all these good intentions and supportive moves may indeed improve business in Musselburgh town centre, the mix so far echoes the effort made almost twenty years ago in Dunbar when several million were spent on a leisure pool and revamp of the High Street. That had no significant effect on improving business and, by altering the parking provision, caused some people to think it had actually damaged retail business. The present Musselburgh strategy (if it can be called that) pretty much fails the same test. This entry was posted in Commerce, Community and tagged Musselburgh; town centre strategy; town planning. Bookmark the permalink. I wonder if anyone who proposed this plan has any background in destination tourism or commercial development? Why does the recognition of the problem never result in seeking experienced opinions. Investment would clearly be of benefit but I agree this is not the answer. Musselburgh needs a rebrand and a new direction not a coat of paint.